From the Academic year 2017/18 we are going to offer the possibility to join a Dual master degree in Mathematics, in conjunction with the Universitat de València and the Universitat Politècnica de València. The Università di Ferrara, founded in 1391, is one of the oldest universities in Europe and its departments are located in prestigious historical buildings throughout the city. Its identity is rooted in the historical and cultural tradition that welcomed and formed famous figures such as Copernicus and Paracelsus. The quality of education and research, and the facilities available to students and guests, make Ferrara one of Italy’s top-ranking universities, also demonstrated by excellent results in international rankings. Its dynamic campus is spread throughout the city, fostering interaction among national and international students. The University of Ferrara is among the founders and leading partners of various international networks, such as UniTown – Network of Excellence for University Cities, and Routes Towards Sustainability. It is fully committed to a policy of equal opportunities and provides a number of special services to students and guests, including support in finding accommodation in Ferrara. The University also offers a Sports Centre, open to students and the general public, to promote and increase participation in athletic activities, a Language Centre, for intensive and longer courses in Italian language, academic and professional English language, also equipped with comprehensive learning materials for self-study, and a Centre for the performing arts, a University Choir, and other libraries. More than 45,800 undergraduate students and 8,600 postgraduate students take classes taught by more than 3,300 professors, lectures and researchers at the campuses (Blasco Ibáñez, Burjassot-Paterna and Tarongers) with the support of over 1,700 administration and service staff. The university mission of teaching, research, creation and dissemination of culture, transfer of knowledge to the public and private sector, international cooperation and solidarity ranks it second in Europe in receiving Erasmus students and, according to the most prestigious international rankings, is third among Spanish universities in research. It could be defined as an institution of international reference that unites tradition and modernity, science and knowledge, culture and society. The main effort is to make a better, more sustainable, advanced and equal society, to provide a higher quality of life for citizens. The Universitat Politècnica de València is the only technological university in Spain to feature in all the world university rankings. 600.000 sq.m of comprehensive training to prepare for the world of work, to effort, to innovation, to entrepreneurship; to internationalization and to social and environmental commitment. A prestigious public university that offers undergraduate degrees, dual degrees, masters and more than 1,800 lifelong learning courses. The UPV encourages new learning formats and brings the world of real work closer to the classroom. Students learn how to solve problems: in the lab, in workshops, in project rooms, in the library, in the Student Recreation Centre, in the language centre. The UPV has twice received the International Campus of Excellence award and in 2018 and 2017 has gained the title of "Best Technical University in Spain" in the Academic Ranking of World Universities (ARWU). The University has partnerships with institutions in 50 different countries, allowing students to complete their studies in the best universities in the world, or to undertake their first work experience in another language. 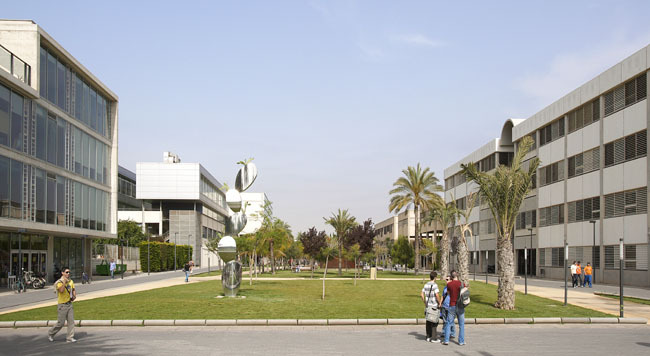 The Polytechnic City of Innovation is the nerve centre of R&D and innovation at the UPV. The 1,600 scientists and 400 support staff who work there are surrounded by cutting-edge technological equipment, The European Space Agency information facilities, the germplasm bank, the immersive neurotechnology lab. The UPV is among the universities with the highest revenue from competitive research: from R&D contracts, consulting and service delivery to technology licenses and spin offs. It is also the national leader in patent exploitation. The UPV has modern facilities and excellent services, managed in an efficient and sustainable way, as well as outstanding sports facilities. The campus is car-free, with more than 125,000 sq.m of green spaces, cafés with terraces, bank branches and shops.